The kitchen is the heart of your home. It should both reflect your style and provide a beautiful and functional place for you to gather your friends and family. 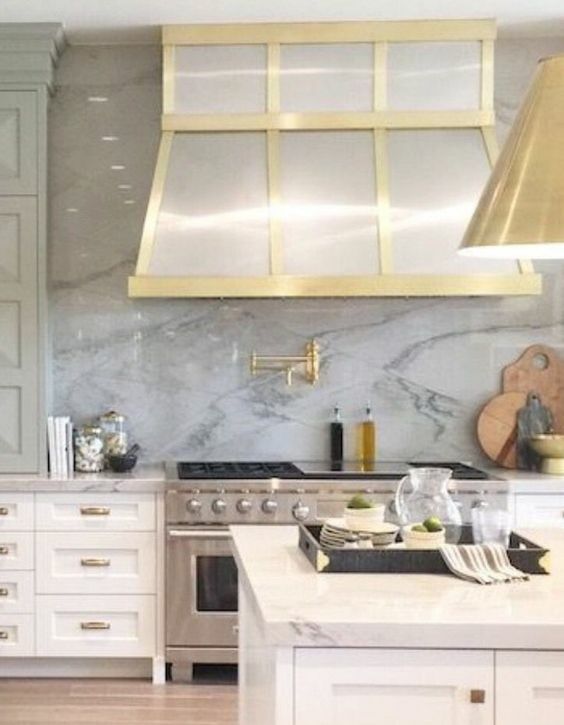 If redoing your kitchen is on your project list for 2019, we have the top 10 kitchen design trends to help give you some inspiration. 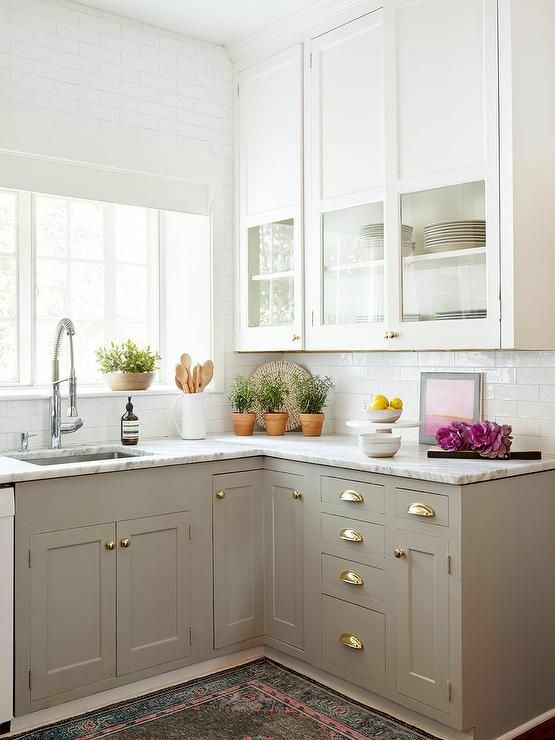 Cabinets don’t all have to be one color anymore-- they don’t even all have to be made out of the same material-- which is great news if you want to add some contrast and dimension to your kitchen. If you’re going to use two-toned cabinets, designers recommend putting the darker color on the bottom cabinets and the lighter on top. This will both add an airiness to the room and help it look bigger. Splashes of color brighten up any room and I’m happy to see it’s back in style for 2019. To add color to your kitchen, try getting a major appliance like your refrigerator, stove or dishwasher in a bright color like mint or red. You can also display colorful dishes on open shelving (see design trend #3) or colorful cooking and bakeware like your Kitchenaid mixer. Open shelving isn’t just practical (it’s storage you can see through), it also allows you to display your dishes and cookware as works of art. You can pair them with heirlooms or other decorative items, and even frame them with an accent wall to create a focal point for your kitchen that’s both functional and beautiful. If you have light colored cabinets and walls, a dark hardwood floor can add warmth to your kitchen. And since this is likely the heaviest-trafficked room in your home, dark hardwood floors have the added practicality of standing up to that high traffic and the wear and tear it can cause over time. 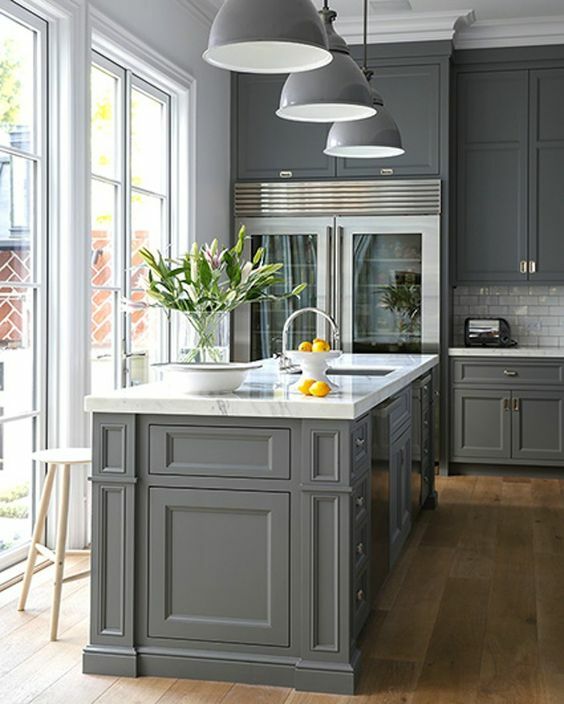 If you want a timeless, classic style kitchen, try a color palette with grey undertones. Depending on your taste, you can choose a blue-grey, a purple-grey, a brown-grey or even a green-grey, and because there are so many options, you can find a shade to match any design elements you’ve already chosen. Heavy metal elements like copper and brass are taking starring roles in 2019 kitchen design. If you have open shelving, plating your stove’s hood in metal can create a focal point in the room while adding warmth. You can also add metal accents in your lighting fixtures by choosing an interesting chandelier or pendants. A statement tile floor can add a bunch of design elements at once. It’s a statement piece, it warms the room, it adds color and dimension and tile is a functionally great choice for a heavily trafficked room. If you love the look of reclaimed wood but want something slightly different, consider this rustic material. The wood has a grainy texture with naturally occurring striations that make it interesting to look at. Its perfection lies in its imperfection, so if you want a uniform look, this might not be for you. From painted wooden knobs to decorative cutouts, interior designers are taking style notes from their English counterparts. This look tends toward the traditional so if that’s your style, try adding cabinet doors that look like window panes and hiding appliances behind them. Whether it’s a black stove, refrigerator or dishwasher, black appliances add sophistication to your kitchen. If your kitchen is on the smaller side, black appliances are a good way to add dimension to the room without making it feel smaller. This list is by no means exhaustive but I hope it’s provided some inspiration for whatever designs you’re dreaming up.